” Magic Mirror tell me today, did all my friends have fun at play?” This was the ending sentence of the daily query from Miss Molly to her children all over the country through her Magic Mirror on the TV program- “Romper Room and Friends.” My sister Molly was in fact, Miss Molly on the show back in the 80s when it was first syndicated nationally out of WOR- TV in New York. My sister was a Carnegie Mellon grad who majored in Music Theatre and following graduation was hired by the Claster family to be the new teacher on the show. 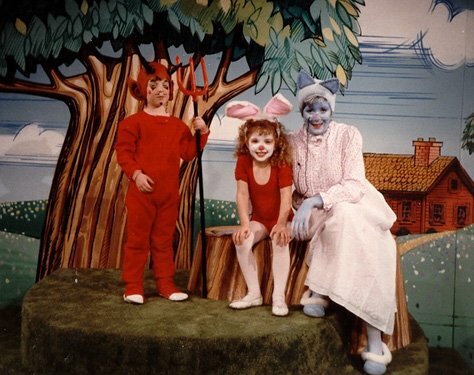 The interesting thing is that I took her to New York for auditions and the last thing she auditioned for was the musical” The Best Little Whore House in Texas.” The following last minute audition was for the Romper Room role and she was hired. What a contrast in auditions. The nice thing about having a sister with some notoriety, especially in the New York City area, is that we usually got a lot of nice perks with restaurant seating, tickets to Broadway shows, and the general satisfaction for me to see my little sister being asked for autographs and posing for pictures with kids of all ages. The neat thing is that Molly was always Molly and never let it go to her head. She was as gracious with strangers as she would be to any of her friends and relatives. I made it a habit to visit her and we would have a great time hitting all the great shows and restaurants and attractions that New York City has to offer. She and her husband Ray lived in Brooklyn at the time and it was always a fun experience for me to come in from the provinces and see the big city. Molly knew how to get around and always told me,” Quit looking up and around Pat, you look like a tourist.” She knew how to give a great hip check to someone trying to squeeze into a cab before us. After the guy would be off balance, she would say,” Get in Pat and don’t look back.” She was sweet and a nice girl but got worldly in a hurry living in the Gotham. Her driving was more aggressive than I remember and still is to this day. I guess you have to survive over there. So one time, I came in to visit Molly and Ray and had my road bike with me to compete in an event that I saw advertised in Velo News, a magazine for cycling races and events. The event was called “The Bronx Biathlon” which entailed a road bike race followed by a running race- no swimming. The venue was a series of closed off parkways in the Bronx which were well marked and attracted a large participation from a variety of New Yorkers. I saw serious tri-athletes, road racers, and runners whose game faces were on and were competitive as one could imagine a New Yorker could be. The bikes were first rate with tri- bars, some disc wheels which were new at the time, and of course the obligatory Campy or Shimano Dura-Ace for components. My bike was no slouch at the time with my 3 Rensho frame and Shimano Dura Ace componentry. But being New York, there were also the competitors who were there just for fun with their beach cruisers or banana seat bikes. The outfits were a hoot with cutoff black Megadeath T-Shirts, black jeans, black tennis shoes, and the random long stainless steel chain connecting their wallets to their black belt loops. In their best Tony Montana impersonations, they tried to fit in but even the guy from the province of Pittsburgh knew they were out of their league. The gun went off and my sister and Ray were my support squad giving me splits and postion reports along the way. It was interesting to be riding on an empty expressway in the middle of the most famous city in the world. I eventually made my way up to the competitive group and the run transition was where I became focused on an age group award. As the runnning portion of the race was winding down, I saw Ray who told me that based on the color of the race numbers which indicated age groups, he thought I was in second or third place and I stepped up my pace to try to win one of the Tag Heuer watches that were the prize. Imagine my disappointment when I found out I was fourth and they gave the overall winner two watches because he won overall and won my age group. To this day, I was amazed that they didn’t go one more deep because of his overall win. But I comfort myself with the fact that they were probably Tag Heuer watches that were most likely purchased at some corner stand on Madison Avenue. The knock off capital of the world. As I got cleaned up and we watched the final awards, we went back to my sister’s car only to find that she had locked the keys in the car. So now, the crowds are thinning and the Megadeath guys are eyeing up my bike and giving us the evil eye. I approached a police officer, one of New York’s finest, an asked for some assistance with a “slim jim.” He coldly told me “no” and to call the Triple A. I looked at him with disdain and asked,” So you are going to let Miss Molly stand here an not be able to get home because you won’t make the effort to get into her car?” Yes- I pulled the card much to my sister’s disgust. But, the officer recognized Molly and said,” Holy s@#$, it is you!! !” He got on the radio and all of a sudden two squad cars, an emergency vehicle, a fire vehicle and another safety vehicle arrived within minutes and it was amazing to see how many officers and paramedics were working feverishly to open the door of the car. Afterwards there were the pictures and the promises by Molly to get all of their kids on the show and to Molly’s credit, she delivered. The children of New York’s finest were all on the show and what could have been an urban disaster turned into a nice affair with children from different parts of the city assembling with their dads on the set of Romper Room. As I flew back that night on People’s Express( remember that dump of an airline? ), I thought about the day, the life in New York, and the happiness that Molly spread to many children every day on a national basis. She saw a lot of kids in that mirror back then and the Bronx Biathlon was a great memory not because of the race, but because of the kindness and generosity shown all around us that day. New Yorkers are a special breed and my sister is a special lady. Thanks for reading. This entry was posted in Uncategorized and tagged Children's Televison, Motivation, New York City, Rompr Room and Friends, Television. Great story, Pat. What’s your sister doing these days? Love that you wrote about your sis! I grew up watching romper room (she might not want to know that!) and remember to this day when I learned from you that she was your sister. It was (and is) too cool. very cool pat great stuff ,your sister is the coolest …you both need to be on TV ,now that would be a show worth getting off my bike for ! Very nice Pat, Moll the Doll might be as talented as her brother. Good job in the Bronx race even though you just missed the podium. Wasn’t right what they did. I think I’ll call my sister. Thanks for writing. A dump of an airline? Sheesh, if it wasn’t for people express, my 3 lovely daughters would not be here! Great post Pat – love ur stories buddy. Great stuff – great life! Haha, you always know how to turn a ‘sow’s ear into a silk purse,’ as my mum would say! love it!